Nearly 11 months after the Stony Brook University administration banned the use of all tobacco products on campus, students are starting to notice results. The Student Health Advisory Council held a third tobacco cleanup effort outside Melville Library on Nov. 13, collecting 2.1 pounds of cigarette butts as opposed to the 14 pounds they collected in November 2015. “When I see people smoking, I’ll ask them, remind them it’s a tobacco-free campus – and no one has ever not put out their cigarette when I’ve said that and that’s great,” President Samuel L. Stanley Jr. said at a student media briefing earlier this month. In April, only four months after the Jan. 1 ban was implemented, the Student Health Advisory Council collected 5.75 pounds of tobacco-related waste. As of October, Stony Brook was one of 14 SUNY schools to implement a smoking ban, according to the American Nonsmokers’ Rights Foundation. 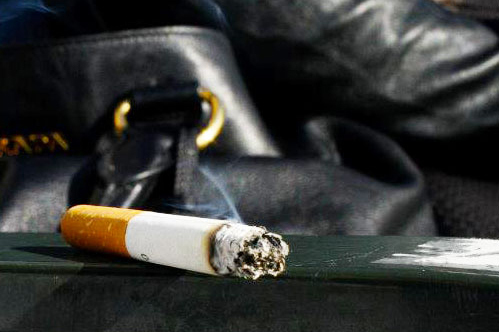 State legislators proposed a SUNY-wide tobacco ban in 2012 but the measure failed to pass. The policy thus far has been peer-enforced, but Stanley said that the university is considering citations for smoking on campus.